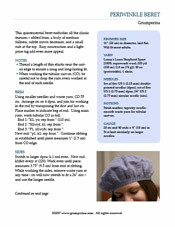 Remember this periwinkle beret I knit for my grandma? About the beret This quintessential beret embodies all the classic features – ribbed brim, a body of medium fullness, subtle crown decreases, and a small nub at the top. Its finished size is 11″ (28 cm) in diameter, laid flat. This will fit most adults. About the pattern This one is as easy as they come! Techniques used: tubular cast-on (explicit directions included), knitting in the round, increases and decreases. 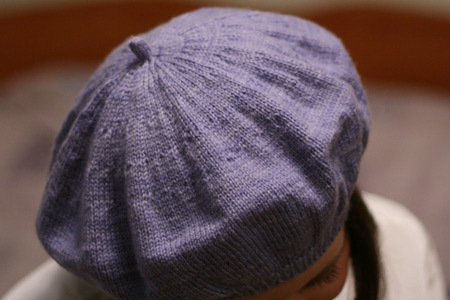 I think the Periwinkle Beret would be a great project for the first ‘knitting in the round’ experience. Simple construction is only enhanced by a light price tag – one skein of Lorna’s Laces Shepherd Sport is all you need! Lorna’s Laces Shepherd Sport [100% superwash wool; 200 yd (183 m)/2.6 oz (74 g)]: 49 ns (periwinkle), 1 skein. Set of five US 1 (2.25 mm) dpns; set of five US 2 (2.75 mm) dpns; 24″ US 2 (2.75 mm) circ. Stitch marker; tapestry needle; smooth waste yarn for tubular cast-on. 28 sts and 40 rnds = 4″ (10 cm) in St st knit circularly on larger needles. Two-page pdf file, 1.5 MB in size. Includes knitting instructions in 12-point font, and two full-color photographs. This file can be opened using Adobe Reader. I always provide support for my patterns, but since you’re paying for this one, I will not settle for anything less than your full happiness and satisfaction. I will contact you if there are any mistakes or updates, and you can always e-mail me for help. 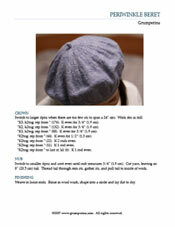 Well, now that I have Prince’s “Periwinkle Beret” going through my head, I guess I should buy one! Nice going! This is a most perfect beret. Expect it to be adorning my head as I stroll the breezy streets of Bath this spring, singing the praises of Grumperina! This will be perfect for my mom, who LOVES berets — thanks! Yeah! I’m so glad you made this pattern available. All your periwinkle talk has me ready to jump on the bandwagon. Oh, I was hoping you would make your beret available for us to knit-such a beautiful design and perfect to take off the March chill. THANK YOU!!! I cannot wait to get started! This is the perfect hat…warm yet stylish. Am such a big admirer of yours. Someone just yesterday posted about a Koigu beret pattern and I thought, but I’d rather have Grumperina’s pattern… SOLD (as soon as I get home to my home computer) Thanks for taking the time to write it up. Awesome! I have JUST the skien for this… thanks SO much! Ooh — I’m so happy that you’re selling this! I tried to do a beret for my grandma this Christmas and ended up with something fit for the Pilsbury doughboy (which I kept for myself, since I’m not easily embarrassed). I’ll have to buy this pattern from you before next Xmas. Any excuse to buy Lorna’s Laces and do something nice for Grandma. Is a beret the same as a tam? I have a daughter pining for a beret so this will be great. Unfortunately she wants one to match for her dog. I will see if I am up for that. are you sure you didn’t miss a decimal pt. and it should be a $250 pattern? i mean, it took a lot of ripping and reknitting. … and the decreases are soooo pretty!!! I love this beret. The color is perfect and you did a beautiful job.